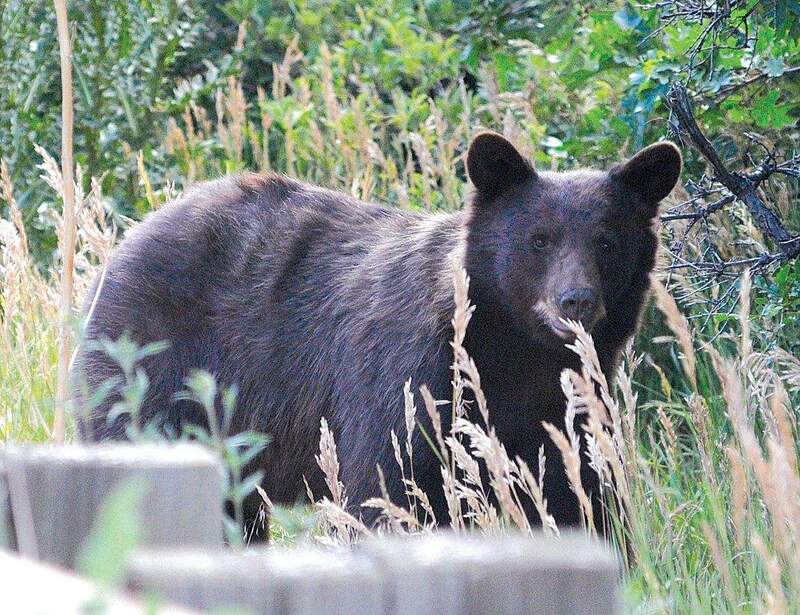 Last year, 1,162 bear sightings were reported to various agencies in La Plata County. Of those, 898 involved bears getting into trash, Here, a black bear pauses before crossing North College Drive. 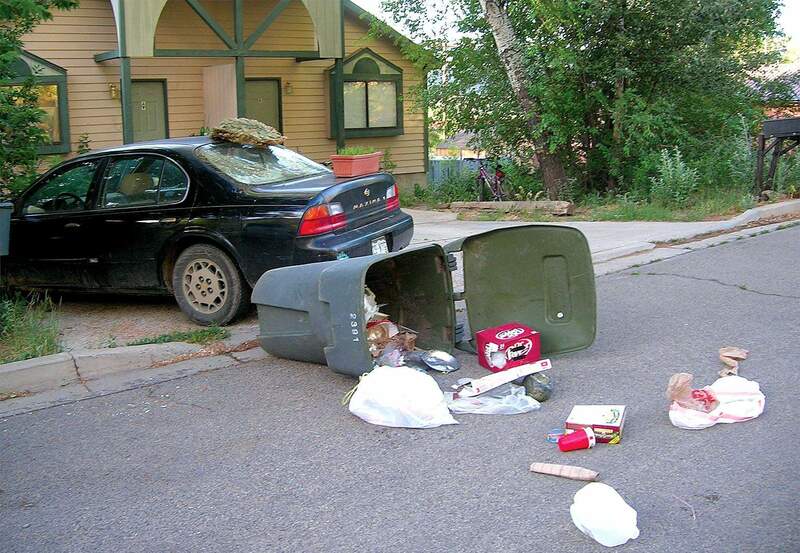 Bears tipping over trash  its a common sight in Durango. This was taken along West Second Avenue. Black bears around Durango have become accustomed to raiding unsecured garbage cans and helping themselves to other food left available by humans. Its elementary, Watson. Keep garbage and trash in bear-resistant containers or keep refuse in a secure spot until the morning of pickup. A violation occurs when trash is strewn. No single source of statistics on bear incidents exists. Bear sightings or reports of bears feasting on garbage can be reported to five locations  the Division of Wildlife, the La Plata County Sheriffs Office, the city of Durango code enforcement office, the Bear Tracker hotline at The Durango Herald and Bear Smart Durango. Bryan Peterson, who founded Bear Smart in 2003 to educate residents about living in bear country, pulls together as many statistics as possible. As of Monday, there had been 141 total reports of bears since the ursines came out of their deans in the spring, Peterson said. Eighty-three of the reports involved bears in trash. Twenty-nine trash incidents were in unincorporated areas and 54 in Durango, he said. A review of ordinances may be in order. The county ordinance applies to single-family homes, condominiums, apartment buildings and businesses throughout the county, not just bear-prone areas. Dogs, coyotes and raccoons also get into trash. A bear-resistant garbage can, purchased or leased, is required unless refuse can be stored safely elsewhere. A fine of $200 is levied for the first offense unless the violator buys or leases a bear-resistant container. A second offense brings a fine of $300, and each subsequent offense draws a fine of $500. The ordinance is enforced by the Sheriffs Office, which determines whether to issue a warning or a notice of violation on the first offense. Sheriffs spokesman Dan Bender found 12 reports of bears from May 7 through Monday. But the two officers who track bear incidents were out of the office last week, he said. As far as I know, no one has received a citation, Bender said. About 4,500 customers have garbage picked up by the city. About 370 of them have bear-resistant containers. After an initial courtesy notice of a violation, homeowners are required to store trash so marauders cant get it or lease a bear-resistant container from the city for $4 a month. Also, they must leave cans curbside only from 6 a.m. to 7 p.m. on pickup day. Businesses and multifamily residences may obtain a bear-resistant container from their waste-service provider. A second violation will bring a $50 fine. All subsequent violations cost $100. The ordinance also prohibits the storage of refuse, pet food or grains and seeds in a way that attracts wildlife. Steve Barkley with the citys code enforcement office said that in 2010, there were 90 violations of the ordinance. Sixty first-time violators opted to rent a bear-proof container and 30 paid a fine, he said. In 2010, there were 1,162 bear sightings or incidents reported to Bear Smart, the Division of Wildlife, the city of Durango code enforcement office, the Sheriffs Office or the Bear Tracker program at The Durango Herald, Peterson said. Bear-in-trash reports accounted for 898 of them. The Division of Wildlife chose Durango for its five-year study because of its proximity to prime bear habitat. Researchers want to determine bear numbers, learn how bears function in urban areas and how to reduce human conflicts with bears. Theyll do it by trapping and outfitting 50 female bears with Global Positioning System collars to track their movement. Cage traps, hair samples and genetic information will identify individual animals. b Keep smelly food scraps in the refrigerator until the day of trash pickup. b Wash cans, bottles and jars to reduce odors. b Wash garbage cans frequently with ammonia to eliminate odors. b Dont leave pet food outside. b Keep garage doors closed. b Take down bird feeders in the summer. Birds have enough natural food until fall.